By having a walk in tub installed in your home in Minneapolis, Minnesota, you’ll no longer have to worry about slipping and falling as you step high to get into and out of your bathtub. You’ll be able to comfortably and safely walk in and out of your bathtub, which can provide you with a great sense of relief. For top-of-the-line walk in tubs, turn to U.S. Patio Systems and Home Remodeling. We offer high-quality walk in bathtubs from the famous Safe Step Walk-In Tub Co. In addition to providing beautiful and well-made walk in tubs, we can also expertly handle the installations for you. Our walk in bathtubs also come with spa-like features to ensure you enjoy every bath. 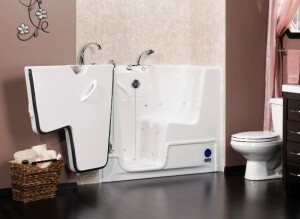 After a stressful day, you can relax in your new bathtub that’s equipped with a heated seat and a jet therapy system. You’ll feel like you are at a spa while in your very own home. To learn more about adding a walk in tub to your home in Minneapolis, MN, contact U.S. Patio Systems and Home Remodeling today. Our team of specialists is available to answer any questions that you might have.